Home » Face » Foundation » Cushion Foundation Week Day 5 : Shu Uemura Blanc:Chroma UV Brightening Cushion Foundation is not a cushion! 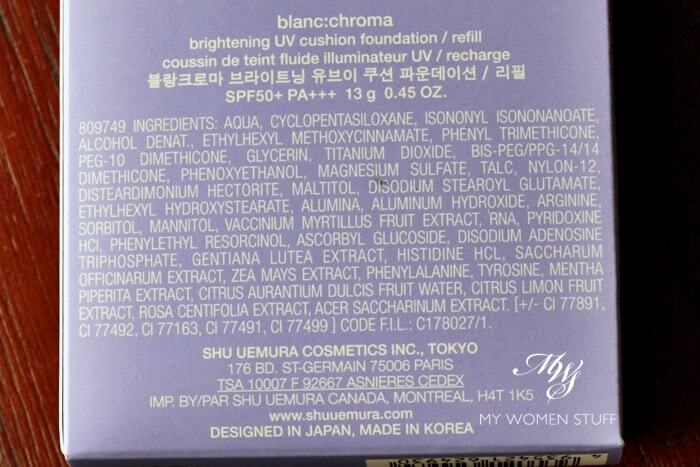 Cushion Foundation Week Day 5 : Shu Uemura Blanc:Chroma UV Brightening Cushion Foundation is not a cushion! 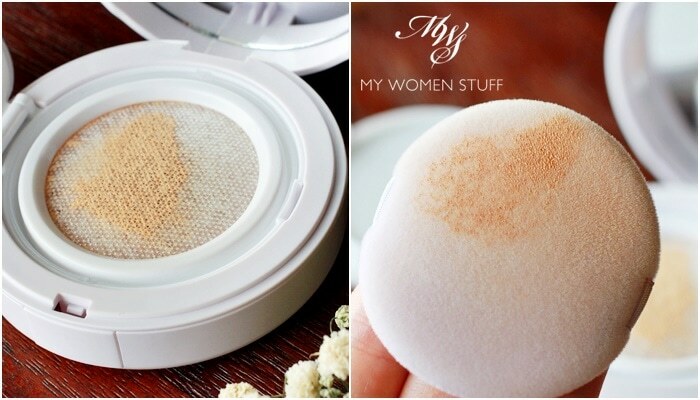 Welcome friends, to Day 5, and the final day of Cushion Foundation Week on My Women Stuff! This has been the new wave of foundations to hit our counters, popularised by Korean brands and formulations, so I wanted to keep it all in one place. What I did over the past few days, was to tell you what I thought of the cushion foundations from a particular brand. Save the first one, all the other cushion foundations I have featured are from the Western brands, because that’s what I have on hand. After this, I’ll do a quick round up with some general thoughts, and also tell you what I think about cushion foundations in general so look out for it then. I wasn’t too surprised to see a cushion foundation coming out of Shu Uemura. Their sister brand, Lancome, had already launched one last year and it stood to reason that Shu Uemura would follow. Like most brands out there, Shu Uemura placed their cushion in their whitening/brightening skincare range. Currently, that’s the Blanc:Chroma range. The names have changed so often, I can’t keep up! You’d think however, that since L’Oreal had the advantage of experience, after working on the Lancome cushion, that they’d be doing some wonderful things with this one from Shu Uemura. Well, let me just say that they didn’t. The Shu Uemura Blanc Chroma cushion foundation offers SPF50+ and PA+++ sun protection that is very high and broad-spectrum, and perfect for where I live. I however, use this on top of regular sunscreen, not as a replacement for it. The high sunscreen protection jives with the intended use of these cushion foundations, as popularised by the the Korean brands – as a sunscreen top-up you can use through the day. If you look at the ingredient list however, I noticed that the sunscreen ingredient is not placed very high on the list. If you quickly scan through the ingredient lists of the cushions I featured in the past few days, you will see Titanium Dioxide or Zinc Oxide in the top 3-4 ingredients listed. For this one, it’s 8 or 9 down the list. Something to note, if you want to use this as a sunscreen as opposed to makeup. I advise using it as the latter. Yes, this deserves an all caps situation, because despite calling this a UV Brightening Cushion Foundation, Shu Uemura did NOT put a cushion in this compact! Are you confused? Let me explain. Do you see that strange surface of the “cushion” in the Shu Uemura Blanc Chroma cushion foundation? When I opened the cover (no seal! Tsk tsk!) I was confronted with a very weird white netting. You’ll see a slightly better close up picture below. There’s no cushion in this thing – it’s a weird netting. Shu Uemura calls this a “non woven fibre matrix” Pfbbtt! It’s rockwool fibre, or close to it. I found it strange and almost surreal. This is a cushion, Shu Uemura. You CALL it a cushion foundation and yet, you don’t put a sponge cushion in it? Perhaps their cushions are stuffed with fibre and not sponge. I don’t know. Whatever it is, I was not pleased! And then we come to the refill. For the Shu Uemura Blanc Chroma cushion foundation, everything is sold separately. Case, refill, puff … EVERYTHING. Again, what’s up Shu?! What this means is that you get the case in one box, and the foil sealed refill in another. I believe that locally, the lilac puff may come with the case, as mine did, but no new puff comes with the refill. So I was puzzled at this. Every other brand I’ve come across has a puff packaged with their refill. It’s for hygiene purposes and it makes perfect sense. How much does a puff cost anyway?! Instead, in Japan anyway, the puff is sold separately as I found out from this very scathing review (which I fully concur with btw). Tsk tsk tsk… another point docked from the already low ratings. The cushion, if I can call it that, is a pretty pathetic excuse for a cushion. The way it is assembled is a little similar to the Bobbi Brown cushion foundation, in that it’s white when it arrives. When you depress the surface, the foundation will seep up through the fibres, and then through the netting. It’s weird. The netting has a weird, crackly plastic feel to it that sends shivers down my spine. It feels… cheap. Suffice to say, nil points for this NOT being a cushion in any sense of this being called a cushion foundation. Innovative? I think not. And then we come to the applicator where I will sit here, and generally try to refrain from tearing my hair out. Shu Uemura tried to be innovative with their cushion foundation. Sure, there are loads out there, and they all look the same – there must be a reason. It bloody works, that’s why! Stop trying to reinvent the wheel! Almost all the cushion foundations I’ve ever come across use a puff with a sponge/rubber surface. The primary reason is because surfaces like this do not absorb product as quickly as fabric. Secondly, it actually picks up product better from the surface of the cushion, and here’s the most important bit, deposits it better on your skin. When you pat it on, you transfer the product from the sponge to your skin and the sponge helps the product adhere to your skin. Think of it the way you’d use a sponge, like the beautyblender, to apply liquid foundation. Tap on, pat off. It works. What did Shu Uemura decide to be innovative with? They put a bloody flocked puff in there. The same puff you find in a pressed powder. Hello? You know why this does NOT work? A flocked puff will pick up product, sure. But, the product will not transfer properly to your skin if you pat it on. It does not have the adhesion that a sponge/rubber surface gives, and therefore does not give the dewy effect of a product being patted on. If you wipe it on, it transfers the product. And that kind of defeats the whole purpose of this being placed in the cushion foundation category. It’s absolutely useless. Instead, just use a sponge, or a brush. Or better yet, skip this altogether. Packaging and misnomer aside, the contents of the Shu Uemura Blanc:Chroma cushion foundation is quite nice. I will give them that. There is a nice balance of moisture and coverage, which makes it seem almost, like Shu emptied a bottle of their liquid foundation in this compact because it has a very foundation feel to it. I gave up using the puff provided, and used the puff from a different brand to apply. WORKS SO MUCH BETTER! See, Shu, don’t reinvent the wheel. The coverage is light-medium and quite buildable. I didn’t think it was too glowy or shiny on my skin and it seemed to dry down to a semi-matte finish. Seemed to work just as well without powdering over, like the Clinique one. 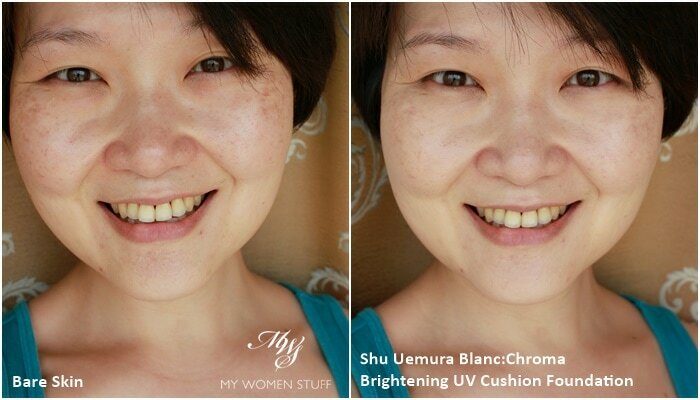 Here is an idea of how it looks in a before-after photo using the Shu Uemura Blanc Chroma Cushion Foundation in 774. Coverage is decent as you can see. It not only evens out skintone and redness, it even manages to hide some of the blemishes and pigmentation on my skin. 774 is slightly warm toned, but light and neutral enough for my skin and even seems to brighten it a little. If this was a liquid foundation, I’d say that I like this a lot. The texture is lovely, the coverage is decent and the finish was comfortable. But since it comes in a terrible packaging, I find it hard to accept it as it stands. 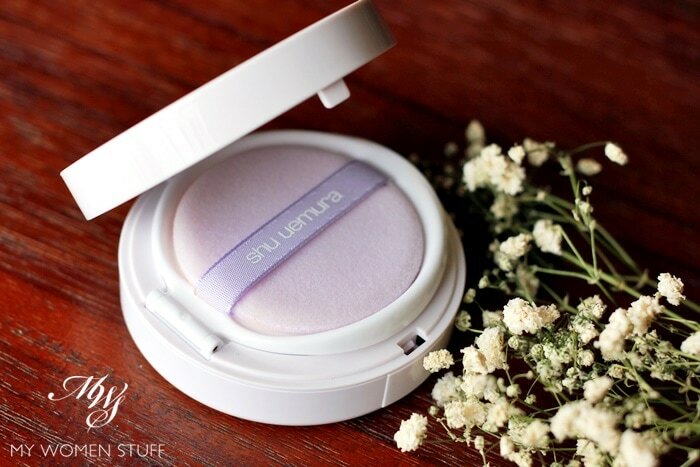 This is another fairly impressive point for the Shu Uemura Blanc:Chroma cushion foundation. There are 6 shades in this range – 564, 574, 594, 754, 764, 774. I’m not too familiar with Shu’s numbering system as it’s been a long while since I used their bases, but I think the ones that start with 5 have a more pink base, while the ones that start with 7 have a yellow base. I don’t know how else the numbers go, but they have catered for different skintones and depth of tone. I’m not sure how deep the deepest shades go, but it tells us there are options. 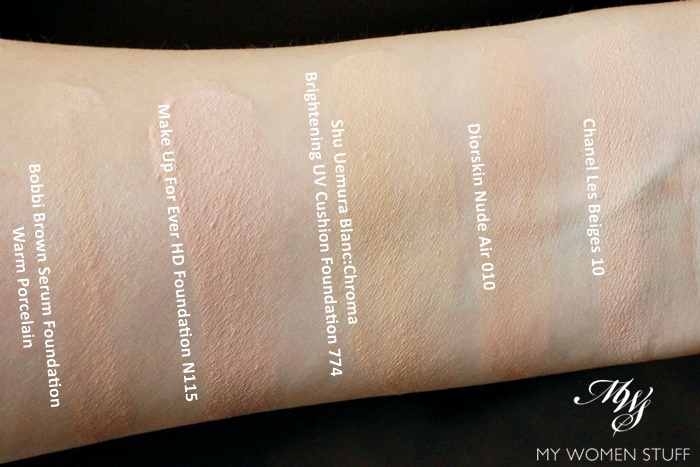 Here is a swatch of the Shu Uemura Blanc Chroma cushion foundation in 774 compared to other foundations I wear. As you can see, it’s a little more yellow than other bases, but because it’s a little sheerer and its light, I get away with it. It doesn’t look too bad on my skin. I think you know the answer. No, I most definitely do not, for the simple fact that they tried to reinvent the wheel and failed miserably in my view. I was sent this by the brand and I’m afraid there’s no way I can tell anyone to try this, even in the name of experimentation, without being overcome by guilt for making you actually pay for this. I’m sorry, Shu, it’s ok if you don’t want to send anything else, just make what you make, better. Calling this a cushion foundation and then departing from the essence of a cushion is unforgivable. The terrible flocked puff included was the final nail in the coffin for me. The foundation itself is decent. The packaging and delivery system is terrible. For the money, I say get yourself a bottle of Shu Uemura foundation and forget this ever existed. Does this Cushion Foundation intrigue you? Have you checked it out? Sorry mates to end off Cushion Foundation Week on a sour note, but this is as much a cushion foundation as I am the Duchess of Cambridge. Their liquid foundations are decent. Give them a go. Skip this travesty. 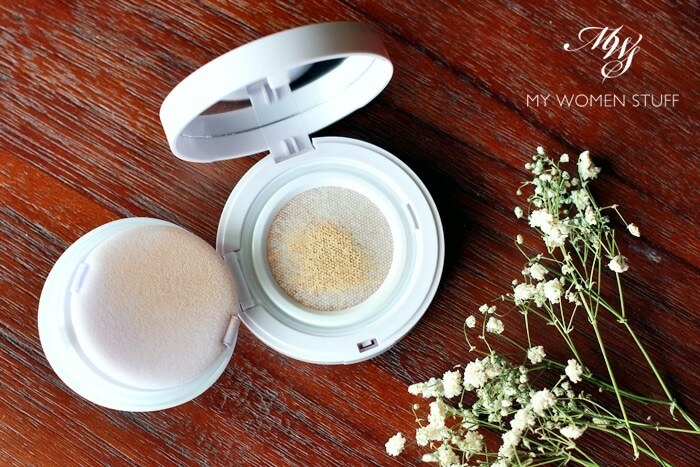 PREVIOUS POST: Cushion foundation week Day 4 : Dior Diorsnow Bloom Perfect Perfect Moist Cushion Foundation is very K-beauty! Pretty sad, this review. One would thought they at least made a decent cushion but maybe they tried to separate themselves from the traditional cushion that they are outstanding … in a bad way. I like the coverage on your skin and that they have more shades to select but hesitate to try based on the hardware (yeah, that term came when you have computer background LOL). Maybe they should market this product as not cushion but some innovative foundation with better applicator haha. The BB cream is a DREAM to use, but it also came with the weird mesh, and sadly, mine completely dried out after 1-2 days! I’ve been sticking to tubes/bottles ever since. Hi Paris, the first time i tried the cushion i also thought its a miss for me. Becos it looks so made up and its v hard to blend w e puff. But trick is less is more. And u have to glide to blend the product out. Coverage is v good! I even could skip concealing my dark circles! Maybe u can give it another shot ? Hahaha, I didn’t even notice it wasn’t a ‘real’ cushion, probably because I don’t have any other ones to compare to! Nor did I notice anything strange about the puff, just that it was kinda hard to use but I got used to it within 2-3 attempts at it. I do like the foundation itself, like you said it had good coverage and it didn’t disappear off of my face or make it oily. I might buy a Korean one next time just for comparison’s sake. Final review for bb cushion already :(? How about YSL? There are tons of hype about the YSL cushion! Yep, I don’t know what they’re thinking to be honest. The packaging is such a failure IMO which detracts from a pretty decent foundation! I thoroughly enjoyed this scathing review (even more the extra scathing one you linked to). Shu uemura failed big time in creating this abomination. I saw the photo of the other scathing review, the one where she removed the net and all you see is foundation in wool. Yuck. I’ll be staying away from this, that’s for sure! And i do agree with you, what’s with the reinventing of the so called soft and fluffy puff anyway. Haha. You must try Laneige cushions, if you haven’t or maybe i missed your post.